According to the CDC, one in 59 children in the United States has been diagnosed with autism spectrum disorder. Though very early intervention has been proven to maximize the impact of physical, speech and behavioral therapies, many parents and caregivers are unaware that detection is possible at an early age. "While signs of autism vary widely in type and severity, early detection is key to improving long-term outcomes," said National Autism Association President Wendy Fournier. "Our goal with Autism SOS is to help parents identify early warning signs so they can screen and start intervention as early as possible." 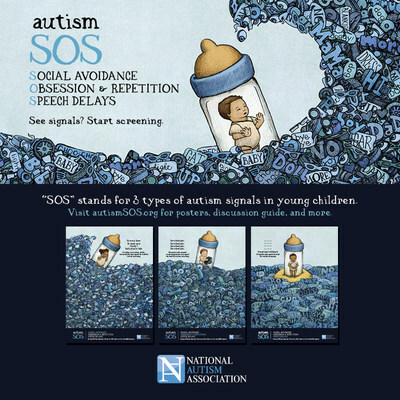 Caregivers can share their stories on Facebook and visit AutismSOS.org to learn more about the symptoms of autism; download, print and share a series of Autism SOS awareness posters; and link to an online autism screening tool. Visitors also have access to a discussion guide on how to properly approach the caregiver of a young child they suspect may be showing signs of autism. "Autism SOS started from the personal experience of one member of our team who has a child with autism, and his desire to help other families facing the same issues," said Neon managing director Kevin McHale. "The idea sparked passion from around the agency and network to bring this powerful message to parents and families struggling with recognizing the early signs of autism." Autism SOS launched today on Facebook, Twitter and Instagram. Follow the initiative's hashtag, #AutismSOS, and visit AutismSOS.org for more information. The National Autism Association (NAA) is a leading autism nonprofit organization addressing the most urgent issues facing the autism community today. Founded by parents, the group is dedicated to providing high-impact, tangible tools directly to individuals, families, and service professionals. Along with sounding the alarm on autism-related wandering/elopement, NAA has spearheaded multiple programs and initiatives, including The Big Red Safety Box Program, Give A Voice Program, ATRIUM Initiative, awaare.org, and the Autism Safety Coalition. NAA's core message of "Never Give Up" has incited hope and strength within the autism community since it was founded in 2003. FCB Health Network is one of the world's most awarded communications networks, focused on creating game-changing marketing solutions for consumers, patients and healthcare professionals. With specialized units covering a wide range of wellness practices, FCB Health Network employs more than 1,800 people across an extensive global network, delivering multichannel capabilities that include DTC and HCP communications, professional education, branding, scientific services, strategic planning and media services. Its integrated agency offering includes Area 23, AREA 23 ON HUDSON, BX – Brand Experience Design Group, FCB Health Amsterdam, FCB Health Brasil, FCB Health Canada, FCB Health Frankfurt, FCB Health Hampshire, FCB Health London, FCB Health New York, FCB Health Zurich, FCBCure, FCBVIO, Mosaic Group, Neon, ProHealth, Solve(d), Studio Rx, Studio Rx Productions and Trio. The FCB Health Network was named "Agency of the Year" by Med Ad News in 2006, 2009, 2015 and 2017, and by Medical Marketing & Media in 2007, 2010, 2015 and 2017. In eight of the past nine years, an FCB Health Network company has received "Most Creative Agency" honors. Cannes Lions, the world's preeminent annual creative awards festival, named its Area 23 unit "Healthcare Agency of the Year" in 2017, and named FCB Health Network "Healthcare Network of the Year" in 2018.